Identification: Loosestrife Family (Lythraceae). Purple loosestrife is an erect perennial herb that develops a strong taproot, and may have up to 50 stems arising from its base. Its 50 stems are four-angled and glabrous to pubescent. Its leaves are sessile, opposite or whorled, lanceolate (2-10 cm long and 5-15 mm wide), with rounded to cordate bases. Leaf margins are entire. Leaf surfaces are pubescent (USDA plants database 2008). Each inflorescence is spike-like (1-4 dm long), and each plant may have numerous inflorescences. The calyx and corolla are fused to form a floral tube (also called a hypanthium) that is cylindrical (4-6 mm long), greenish, and 8-12 nerved. Typically the calyx lobes are narrow and thread-like, six in number, and less than half the length of the petals. The showy corolla (up to 2 cm across) is rose-purple and consists of five to seven petals. Twelve stamens are typical for each flower. Individual plants may have flowers of three different types classified according to stylar length as short, medium, and long. The short-styled type has long and medium length stamens, the medium type has long and short stamens, and the long-styled has medium to short stamens. The fruit is a capsule about 2 mm in diameter and 3-4 mm long with many small, ovoid dust-like seeds (< 1 mm long) (USDA plants database 2008). Table 1. States with nonindigenous occurrences, the earliest and latest observations in each state, and the tally and names of HUCs with observations†. Names and dates are hyperlinked to their relevant specimen records. The list of references for all nonindigenous occurrences of Lythrum salicaria are found here. Ecology: Purple loosestrife is a wetland plant, growing in freshwater wet meadows, tidal and non-tidal marshes, river and stream banks, pond edges, reservoirs, and ditches. It prefers moist, highly organic soils but can tolerate a wide range of conditions. It grows on calcareous to acidic soils, can withstand shallow flooding, and tolerates up to 50% shade. Purple loosestrife has low nutrient requirements and can withstand nutrient poor sites. It flowers from July until September or October. Flowering occurs 8-10 weeks after initial spring growth. Thompson et al. (1987) estimated that on average, a mature plant produces about 2,700,000 seeds annually. Seeds are relatively long-lived, retaining 80% viability after 2-3 years of submergence (Malecki 1990). Means of Introduction: Purple loosestrife seeds are mostly dispersed by water, but wind and mud adhering to wildlife, livestock, vehicle tires, boats, and people serve also as agent. It was introduced into North America through ships' ballast and as an ornamental. In states where it is permitted, purple loosestrife continues to be promoted by horticulturists for its beauty as a landscape plant and for bee-forage. Probably introduced to the Great Lakes region via canals. Status: Established. State noxious and highly invasive status and wetland indicator values. L. salicaria has been labeled the “purple plague." because of its epidemic devastation to natural communities. The species is included on the Nature Conservancy’s list of “America’s Least Wanted -The Dirty Dozen” (Flack & Furlow 1996). In response to the alarming spread of this exotic species, at least 13 states (e.g., Minnesota, Illinois, Indiana, Ohio, Washington, and Wisconsin) have passed legislation restricting or prohibiting its importation and distribution (Malecki et al. 1993; Strefeler et al. 1996b). 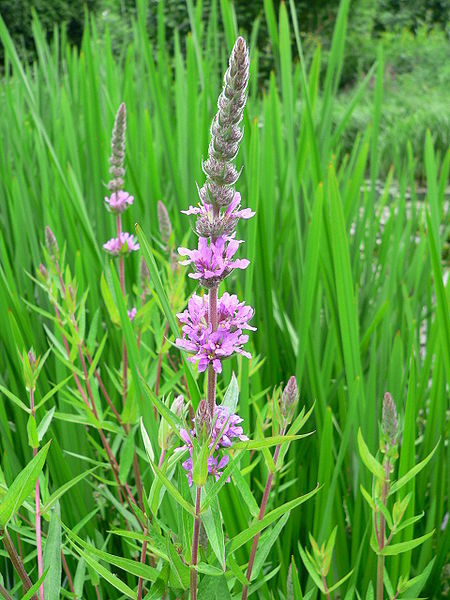 Impact of Introduction: Purple loosestrife adapts readily to natural and disturbed wetlands. As it establishes and expands, it outcompetes and replaces native grasses, sedges, and other flowering plants that provide a higher quality source of cover, food, or nesting sites for native wetland animals (U.S.EPA 2008). The highly invasive nature of purple loosestrife allows it to form dense, homogeneous stands that restrict native wetland plant species, including some federally endangered orchids, and reduce habitat for waterfowl. Purple loosestrife causes annual wetland losses of about 190,000 hectares in the United States (Thompson et al. 1987; Mal et al. 1997). The species is most abundant in the Midwest and Northeast where it infests about 8,100 hectares in Minnesota, 12,000 ha in Wisconsin, over 12,000 ha in Ohio, and a larger area in New York State. Recent distributional surveys document the occurrence of monocultures in every county in Connecticut, where it has been found in 163 wetland locations (Ellis and Weaver 1996; Ellis 1996). At the Effigy Mounds National Monument (EFMO), combined populations of purple loosestrife cover an area of 5 to 10 hectares growing in regularly disturbed sites. This species has a major visual impact on the vegetation of EFMO, and it has the potential to invade and replace native communities endangering the areas' primary resources (Butterfield et al. 1996). Numerous studies demonstrate the aggressive and competitive nature of purple loosestrife. Fernald (1940) reported a loss of native plant diversity in the St. Lawrence River floodplain following the invasion of purple loosestrife and another exotic, Butomus umbellatus L. Gaudet and Keddy (1988) report declining growth for 44 native wetland species after the establishment of Lythrum. Among the species tested, Keddy (1990) found that purple loosestrife was the most competitive. In the Hamilton Marshes adjacent to the Delaware River, annual above-ground production of L. salicaria far exceeded all other plant species’ production combined. The invasion of L. salicaria alters biogeochemical and hydrological processes in wetlands. Areas dominated by purple loosestrife (Fig. 2) show significantly lower porewater pools of phosphate in the summer compared to areas dominated by Typha latifolia L. (Templer et al., 1998). Purple loosestrife leaves decompose quickly in the fall resulting in a nutrient flush, whereas leaves of native species decompose in the spring (Barlocher and Biddiscombe, 1996; Emery and Perry, 1996; Grout et al., 1997). This change in timing of nutrient release at a time of little primary production results in significant alterations of wetland function and could jeopardize detritivore consumer communities adapted to decomposition of plant tissues in spring (Grout et al., 1997). Specialized marsh birds avoid nesting and foraging in purple loosestrife (Blossey et al., 2001a). The federally endangered bog turtle (Clemmys muhlenbergi Schoepff) loses basking and breeding sites to encroachment of purple loosestrife (Malecki et al., 1993). Remarks: Other species of Lythrum that grow in the United States have 1-2 flowers in each leaf-like inflorescence bract and eight or fewer stamens compared to L. salicaria, which has more than two flowers per bract and typically twelve stamens per flower. L. virgatum, another species introduced from Europe closely resembles L. salicaria, but differs in being glabrous (lacking plant hairs), and having narrow leaf bases. The latter two species interbreed freely producing fertile offspring, and some taxonomists (Rendall 1989) consider them to be a single species. Four species have been approved for introduction for biocontrol of purple loosestrife and have been released: a root-mining weevil, Hylobius transversovittatus Goeze; two leaf beetles, Galerucella calmariensis L. and Galerucella pusilla Duftschmidt; and a flower-feeding weevil, Nanophyes marmoratus Goeze. Blossey, B., L. Skinner, and J. Taylor. 2001. Impact and Management of purple loosestrife in North America. Biodiversity and Conservation 10: 1787-1807. Butterfield, C., J. Stubbendieck, & J. Stumpf 1996. Species abstracts of highly disruptive exotic plants. Version: 16JUL97. Northern Prairie Wildlife Research Center Home Page, Jamestown, North Dakota. http://www.npsc.nbs.gov/resource/othrdata/plntguid/species/lythsali.htm. DiTomaso, J.M., G.B. Kyser et al. 2013. Weed Control in Natural Areas in the Western United States. Fernald, M.L. 1940. The problem of conserving rare native plants. Smithsonian Institution Annual Report (1939):375-391. Flack, S. & E. Furlow 1996. America's least wanted "purple plague," "green cancer" and 10 other ruthless environmental thugs. Nature Conservancy Magazine 46(6) November/December. .
Gabor, T.S., & H.R. Murkin 1990. Effects of clipping purple loosestrife seedlings during a simulated wetland drawdown. Journal of Aquatic Plant Management 28:98-100. Gaudet, C.L. and P.A. Keddy. 1988. Predicting competitive ability from plant traits: a comparative approach. Nature 334:242-243. Heidorn, R., & B. Anderson 1991.Vegetation management guideline: purple loosestrife (Lythrum salicaria L.). Natural Areas Journal 11: 172-173. Keddy, P.A., L. Twolan-Strutt, I.C. Wisheu. 1994. Competitive effect and response rankings in 20 wetland plants: are they consistent across three environments? Journal of Ecology 82(3):635-643. Keddy, P., L.H. Fraser, I.C. Wisheu. 1998. A comparative approach to examine competitive response of 48 wetland plant species. Journal of Vegetation Science 9:777-786. LaFleur, A. 1996. Invasive plant information sheet: purple loosestrife. The Nature Conservancy, Connecticut Chapter. Lavoie, C. 2010. Should we care about purple loosestrife? The history of an invasive plant in North America. Biological Invasions. 12: 1967-1999. Lui, K., F.L. Thompson, C.G. Eckert. 2005. Causes and consequences of extreme variation in reproductive strategy and vegetative growth among invasive populations of a clonal aquatic plant, Butomus umbellatus L. (Butomaceae). Biological Invasions 7:427-444. Malecki, R.A., B. Blossey, S.D. Hight, D. Schroeder, L.T. Kok, & J.R. Coulson 1993. Biological control of purple loosestrife. BioScience 43:680-686. Mann, H. 1991. Purple loosestrife: A botanical dilemma. The Osprey 22:67-77. Schooler, S.S., P.B. McEvoy, P. Hammond, E.M. Coombs. 2009. Negative per capita effects of two invasive plants, Lythrum salicaria and Phalaris arundinacea, on the moth diversity of wetland communities. Bulletin of Entomological Research. 99: 229-243. Thompson, Daniel Q., Ronald L. Stuckey, Edith B. Thompson. 1987. Spread, Impact, and Control of Purple Loosestrife (Lythrum salicaria) in North American Wetlands. U.S. Fish and Wildlife Service. 55 pages. Jamestown, ND: Northern Prairie Wildlife Research Center Online. http://www.npwrc.usgs.gov/resource/plants/loosstrf/index.htm (Version 04JUN1999). Trebitz, A.S. and D.L. Taylor. 2007. Exotic and invasive aquatic plants in Great Lakes coastal wetlands: distribution and relation to watershed land use and plant richness cover. Journal of Great Lakes Research 33:705-721. U.S. EPA (Environmental Protection Agency). (2008) Predicting future introductions of nonindigenous species to the Great Lakes. National Center for Environmental Assessment, Washington, DC; EPA/600/R-08/066F. Available from the National Technical Information Service, Springfield, VA, and http://www.epa.gov/ncea.